FRAMINGHAM, Mass.--(BUSINESS WIRE)--Nov. 5, 2014-- This holiday season, celebrate happier and more fashionable workspaces with designer office and home accessories from the new ‘Style at Staples’ assortment. Arriving in Staples stores beginning Nov. 11, the Style at Staples assortment of must-have brands includes the new Cynthia Rowley and Paperchase collections. The floral collection from Cynthia Rowley features lush, elegant prints that will transform your workspace. The gold abstract collection from Cynthia Rowley features bold, metallic graphics that will inspire you. Staples will debut a new unique collection from leading British stationery brand Paperchase. The Paperchase collection showcases distinctive product design and includes notebooks, journals and albums as well as tote bags, accessories and gifts. Inspired by Victorian naturalist collections. Botanical prints and finishes like brass clasps and opulent black ribbon give this collection a rich and tactic feel. Inspired by nautical fashions on the runway, the Anchors Ahoy collection features bold prints, anchors and flashes of gold and copper. Inspired by vintage memorabilia, the Lazy Days collection features ribbons, etchings and photographs to create a scrapbook feeling in the designs. The Paperchase Kraft collection, which features beautifully designed core supplies, will also be available along with other small accessories. 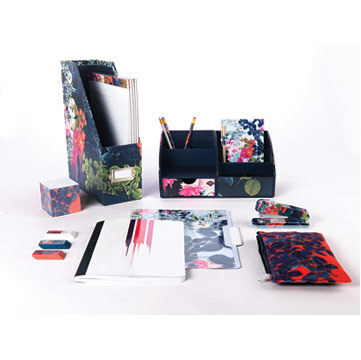 The new Cynthia Rowley Collection and the range of Paperchase products complement the already popular Style at Staples brands including Poppin®, Moleskine® and Staples® Arc which are available in stores and online now. Select styles from Paperchase will also be available on www.staples.com. Just in time for the holiday gift-giving season, Staples makes less stress and more savings happen on the widest selection of gifts and technology with its Price Match Guarantee. Customers can shop however they want, whether it’s online, mobile or in-stores. Additionally, Staples Rewards customers enjoy free shipping and up to 5 percent back in-store and online.